Fantastic performances anchor an almost excessive runtime. Made for fans of behind-the-scenes peeks at the Hollywood system. If there’s one piece of irony when it comes to films about Hollywood, it’s that they’re not made for mainstream audiences. Typically armed with surefire dialogue and larger-than-life characters, these are films made for a far more niche group. Occasionally they can reach a bigger audience, but they’re usually fictionalized: Who Framed Roger Rabbit, Singin’ in the Rain, Adaptation, Tropic Thunder, Get Shorty. So imagine how small the audience for Trumbo will be when it comes to the topic of the “Hollywood 10,” a group of screenwriters thrown in prison for communism. Thankfully, director Jay Roach has delivered his best film yet, armed with a game cast — even if the film barely lives up to its subjects own Oscar-winning abilities. It’s 1947 and we’re on the set of the latest collaboration between Edward G. Robinson (Michael Stuhlbarg) and Dalton Trumbo (Bryan Cranston). While Trumbo is constantly made fun of for hanging out on set, it’s his words that he wants to make sure get brought to life in all their splendor. Meanwhile, Trumbo is living a rocky personal life because he’s a communist, and the government is out to get them. Not even John Wayne (David James Elliott) takes kindly to their sort, and Hedda Hopper (Helen Mirren) has her own agenda to out anyone she can. What do you do when no one in Hollywood will let you write? Just slap someone else’s name on it of course. This leads to Ian McLellan Hunter (Alan Tudyk) winning an Oscar for the Roman Holiday screenplay. 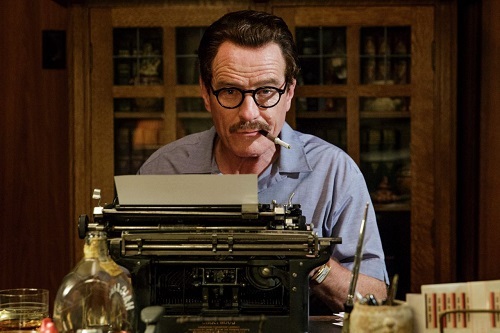 Eventually, Trumbo and some of his closest colleagues — including Arlen Hird (Louis C.K.) — are imprisoned for their beliefs, but that doesn’t stop Trumbo from writing his biggest movie yet: Spartacus. The point the film wants to get across more than anything is that just because someone believes something different than you, doesn’t mean they’re a radical with an agenda. The first amendment is meant for everyone, and if we don’t acknowledge that these kinds of things have happened in the past, then we’re bound to repeat them. As for the film itself, don’t be surprised to see it mentioned in a few categories. Especially Cranston, the man is electric and mesmerizing as he spews the dialogue provided — the best bits are saved for him and C.K. If Trumbo happens to be playing in your area, it’s a sad piece of Hollywood history that shows that it isn’t always flash and glitter behind the scenes.